To keep feet cooler while running in hot weather many people like to run in the thinnest sock possible. Thin socks unfortunately provide little protection from hot spots and blisters. Socks are not the only cause of blisters; therefore no sock can prevent all blisters. Running in hot weather feet quickly get hot and perspire, causing socks to become wet. Moisture significantly increases friction (stickiness) between socks and skin. The higher the friction, the hotter the feet and the greater the chance of getting blisters. Higher friction limits skin surface movement, but still allows inner tissue movement. This shearing effect physically separates the two layers which fill with fluid forming a blister. Drymax Hot Weather Running socks keep feet dry and prevent hot spots and blisters because they are made using the patented Blister Guard® system. This system incorporates Friction Free® Profilen® fibers throughout the entire foot area of the sock. Profilen’s chemical name is Polytetrafluoroethylene (PTFE). PTFE has the lowest Coefficient of Friction of any solid material. This scientific approach keeps feet dry and the friction between the skin and sock low. Runners wearing our Hot Weather Running socks will have cooler, drier, more comfortable feet with far less chance of getting blisters. Hot Weather Running socks also have top mesh panels and bottom air vents designed to keep feet drier & cooler by working with the built-in vent systems in the new generation of breathable running shoes made by Adidas® (Clima Cool®), Asics®, Diadora® (Power Flow), Fila®, Mizuno® (Intercool®), New Balance® (N-Vent®), Nike®, and Reebok®. Drymax's five sock sizes fit because they were developed on special 3D shaped foot models. Each size sock includes a (S, M, L, XL, or XXL) color size mark for easy match-up after laundering. Several features work together as an anti-blister system to actively prevent the formation of blisters. 1) Exceptional 3D fit, 2) Five sock sizes, 3) Seamless insides, 4) An instep-hugging arch band, and 5) Because Drymax socks stay dry, the skin stays dry too; therefore blisters normally caused by sweat or sweat vapor are prevented. The MicroZap® antimicrobial in the Drymax® Fibers is a silver - zirconium phosphate ceramic ion-exchange resin. It fights odor-causing bacteria, helping keep socks odor free. Not a topical treatment; MicroZap is molecularly infused into our Drymax fibers. Being non-migratory and non-toxic, MicroZap provides long term Active Odor Control. The special fibers used in our Drymax Socks have a comfortable springiness and do not get stiff, shrink or lose shape over time. They are designed to last a long time using the highest quality fibers, and abrasion resistant nylon fiber reinforcements in the normal wear areas. If you have any question or request please Contact Us. Why is it so important to keep feet dry? Moisture on the skin creates a host of problems; in hot weather it causes blisters and fuels the growth of odor-causing bacteria, and fungal conditions of the skin (Athlete's Foot), and toe nails. In cold/freezing weather, moisture pulls heat away from skin 23 times faster than air, lowering skin temperature so rapidly that wet feet become painfully cold and are much more susceptible to frostbite. 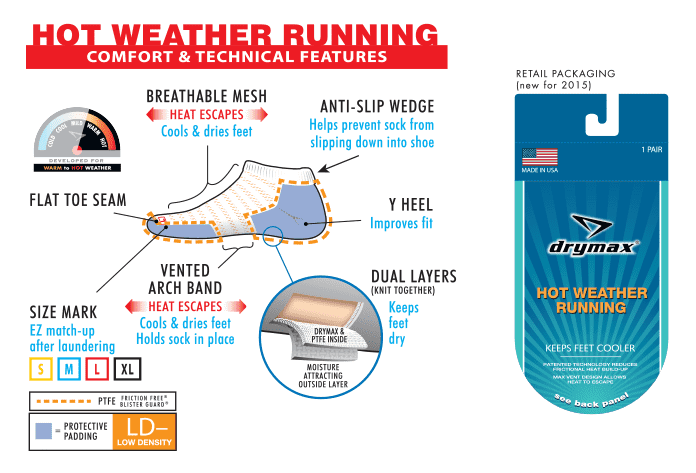 What is the difference between the Drymax Dual Layer System and Double Layer Socks? Our Dual Layer Sweat Removal System has two different fibers interwoven together. We knit our moisture hating Drymax fibers on the inside and moisture attracting fibers on the outside. The Double Layer socks are two separate socks knit together at the toe, heel and top of leg. Why is “a self contained system” important? The inside of most shoes is like a greenhouse; hot & wet. Relatively speaking, little evaporation takes place inside most shoes. Since we cannot predict how well a shoe will absorb or evaporate sweat, we designed a self-contained Dual Layer Sweat Removal System that we could guarantee would keep feet dry in all conditions. Will the Drymax technology wear out or wash out after repeated use or launderings? No. The Drymax fiber technology is permanent and will work for the life of the sock. Drymax technology is not a surface treatment like many wicking fiber technologies. How do Drymax Socks keep feet warmer in cold weather than socks made with other fibers? Sweat pulls heat away from skin 23 times faster than air. In cold/freezing temperatures moisture on the skin reduces the skin’s temperature so rapidly that wet feet quickly feel painfully cold and are much more susceptible to frostbite. Drymax Socks keep feet drier than other socks and therefore can keep them warmer & more comfortable in cold weather. Also, the Drymax fiber is the least thermally conductive fiber used to make socks. That means less heat is lost through Drymax fibers as compared to other fibers like: nylon, polyester, acrylic, cotton or wool which all conduct heat away from the skin at a higher rate than Drymax fibers! Will Drymax Socks completely eliminate blisters? Socks are not the only cause of blisters, so no sock manufacturer should claim their socks can prevent 100% of all blisters. Blisters caused by socks usually develop because the socks do not fit right, have an irritating seam or they become wet. Moisture changes the slipperiness or stickiness (coefficient-of-friction) of the skin, sock, top of the insole and the inside lining of a shoe. Blisters form when the skin rubs, sticks or slides too much inside the sock. In addition, skin tends to soften when it remains wet, making it much more vulnerable to blisters. You've probably noticed how your skin wrinkles and softens after taking a long bath, shower or swim. Because the Dual Layer Sweat Removal System with the Drymax fiber keeps the skin of the feet dry, blisters caused by moisture are eliminated. Wicking (capillary action) is the process by which moisture spreads out and moves from a wet area to drier areas. Wicking takes place because moisture has a greater attraction to the drier parts of the wicking fiber than to itself. Wicking fibers are part of the problem because as the moisture wicks along the fibers, the greater adhesion of the moisture to the fibers causes it to leave moisture behind on the fiber and therefore the skin. Once wicking fibers get wet they stay wet and so do you, at least until well after the long process of evaporation takes place. Many sock companies using wicking fibers make claims like, "Tests show that our (wicking) fiber dries 4 times faster than cotton." Statements like this are misleading. These types of tests are performed in a lab and are not comparable to what happens in the real world. In the lab, they get the fibers wet once, hang them up to dry, then measure the time it takes to dry. These lab tests show how long it takes their socks to dry only after being removed from the source of the moisture. You can’t stop during a marathon or tennis match to allow your socks time to dry. By no means do these tests accurately show how dry their socks can keep sweaty feet. Will Drymax Socks eliminate foot odors? In many cases, yes. Decaying bacteria usually causes foot odor, and bacteria like to grow in damp, warm, dark areas. If moisture is eliminated, so is the environment bacteria like to grow in. However, foot odor is often caused by shoe odor. To completely eliminate foot & shoe odors, in tough cases it may take several products (shoe cleaner, shoe deodorizer spray etc.) to help eliminate all of the odors. ACTIVE ODOR CONTROL - Our v3 and v4 Drymax Socks all contain MicroZap® which is an antimicrobial additive. MicroZap is a silver based zirconium phosphate ceramic ion-exchange resin. MicroZap is not a topical treatment; it is molecularly infused into the Drymax fibers as they are being extruded in the molten stage. This special process makes MicroZap non-migratory and non-toxic, producing permanent long-term odor control for our Drymax socks. Will my feet still sweat when I wear Drymax socks? Yes, your feet will still sweat as Drymax fibers are not an antiperspirant. When I run with Drymax socks my feet feel dry, but when I take them off I see sweat on my skin. After a workout, your feet continue to sweat for a while. This is what you’re seeing after removing your socks. The main thing to remember is that while you are wearing Drymax socks, they keep your feet dry. If Drymax Socks are so good, do college & pro teams wear them? Yes, lots of them do! Why don't you make Drymax Socks with super thick padding? We do not make thick padded socks because we believe they can cause problems. The thickness of the sock directly affects the fit of the shoes and therefore, the comfort of your feet. Since the inside comfort of shoes & boots has increased dramatically over the past few years, the need for thick socks has been eliminated. If you feel your shoes need more cushioning, a good replacement insole is better at cushioning than thick socks. Thick socks have more insulation, making feet sweat more, which in cold weather can lead to colder feet, and in warm weather can make feet more susceptible to blisters and Athlete’s Foot fungus. Drymax socks are designed with 5 different levels of protective padding. This protective padding comes in four densities: Low-, Low, Medium, Medium+ and High. By making our protective padding dense as opposed to thick, it is designed not to affect the fit of the shoes. Do Drymax socks “absorb shock”? Can I use fabric softeners on technical apparel or socks? No. Fabric softeners leave a residual coating on fibers and fabrics, preventing them from performing as designed. To remove fabric softeners, simply launder with detergent and rinse. Why don’t Drymax socks have fancy color patterns and designs like other socks? We don’t make our socks for the eyes; we make them for the feet. To make the driest, most comfortable socks possible, we knit our socks from the inside out. We feel other manufacturers design their socks for their outside appearances; hence all the fancy patterns on the outside and wet feet on the inside! Drymax socks are knit on special knitting machines. We have modified our sock knitting machines’ computer programs and mechanical hardware to include our special features. How durable are Drymax Socks? The special fibers used in Drymax socks have a comfortable springiness and do not get stiff, shrink, or lose shape over time. The whites are crisp and the colors never dull. Drymax socks are designed to last a long time due to the use of the highest quality Drymax & Polyester fibers and special abrasion resistant Nylon fiber reinforcements placed in the normal heel & toe wear areas.